You're invited: At 8 a.m. tomorrow in D.C., I'll interview Larry Kudlow, director of the White House's National Economic Council, live onstage as part of my Axios News Shapers event series. Outside cameras and correspondents welcome. RSVP here. We'll also talk Infrastructure Week with Sen. James Inhofe (R-Okla.), chair of the Senate's subcommittee on transportation and infrastructure; Rep. Eleanor Holmes Norton, ranking member of the House's subcommittee on highways and transit; and Austin Mayor Steve Adler. Hope to see you for breakfast and conversation. The United States delights Israel and infuriate Palestinians today at 9 a.m. ET with the dedication of an interim embassy in Jerusalem, officially marking the move from Tel Aviv. Why it matters: Trump's decision to move the embassy to Jerusalem is a huge milestone in U.S.-Israeli relations. Even if Trump does nothing else until the end of his term regarding Israel, he has already gotten himself into the history books. The U.S. celebrations around the opening of the embassy — both yesterday and today — are far from bipartisan. The congressional delegation to the event — four senators and 10 members of the House — is all Republican. The only people who are not in government who got front row seats at the reception at the Israeli foreign ministry yesterday were Republican megadonors Sheldon and Miriam Adelson. Jared Kushner and Ivanka Trump have been lavished with attention from Israeli politicians — mainly Prime Minister Benjamin Netanyahu, who spoke about them in length during two of his speeches yesterday. What actually happens: The moving is mostly symbolic. 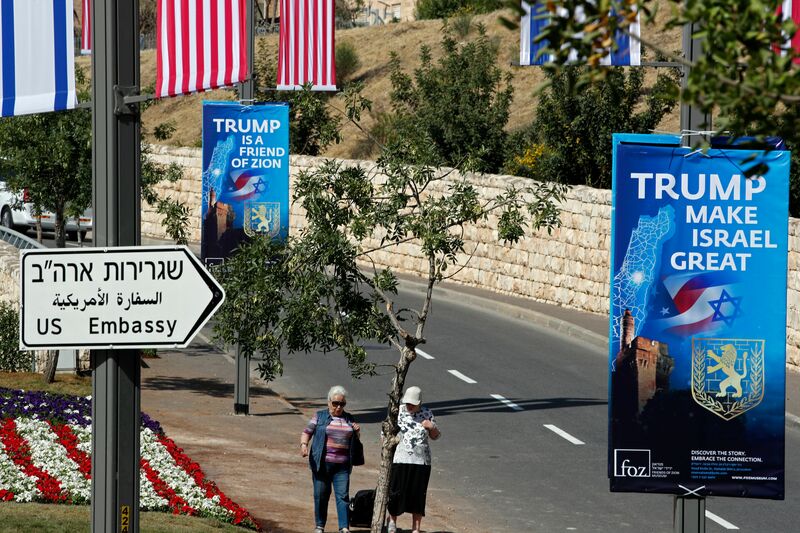 The only U.S. officials who are actually moving at this time from Tel Aviv to Jerusalem are Ambassador David Friedman and four members of his staff. But this is the beginning of a process, and the embassy plans to grow in the next year. It will take several years to build the permanent embassy in Jerusalem. Until then, most U.S. diplomats will continue working from Tel Aviv. What's next ... Trump has made two campaign promises that deal directly with Israel: move the U.S. embassy to Jerusalem, and get the ultimate peace deal between Israel and the Palestinians. Fulfilling his first promise will make it much more difficult to implement the second. Since Trump's Jerusalem announcement in December, the Palestinians decided to cut all ties with the White House. Be smart: The Trump "peace team" is still thinking about launching Trump's peace plan. But if the crisis with the Palestinians — the worst since 2002 — continues, it will be close to impossible to implement it. "[T]he United States recognition of the reality that Jerusalem is the eternal capital of the State of Israel will go down as historically very significant." "We are seeing the implementation of a foreign policy that is really the Trump Doctrine. Seizing the moment has been a critically important part of these historic days." 2. Deep State laments Trump "hostile takeover and occupation"
"In one agency after another, I encountered a pattern: on controversial issues, the Administration is often not writing down potentially damaging information." "For many in government, Trump’s antagonistic relationship to facts is no longer just a matter of politics. It now affects day-to-day governance." "Midway through its second year, Trump’s White House is at war within and without, racing to banish the 'disloyals' and to beat back threatening information." "Bit by bit, the White House is becoming Trump’s Emerald City [as the Green Zone in Baghdad came to be called]: isolated, fortified against nonbelievers, entranced by its mythmaker, and constantly vulnerable to the risks of revelation." "The president vents to associates about the FBI raids on his personal attorney Michael Cohen — as often as '20 times a day' ... and they frequently listen in silence, knowing little they say will soothe him." "Trump gripes that he needs better 'TV lawyers' to defend him on cable news." "The range of witnesses Mueller has called in has been breathtaking, from White House Counsel Donald McGahn — at least twice — to Avi Berkowitz, the 29-year-old personal assistant to Kushner." "On some days, they speak multiple times ... White House staff are aware that the calls happen, thanks to the president entering a room and announcing, 'I just hung up with Hannity,' or referring to what Hannity said during their conversations, or even ringing Hannity up from his desk in their presence." 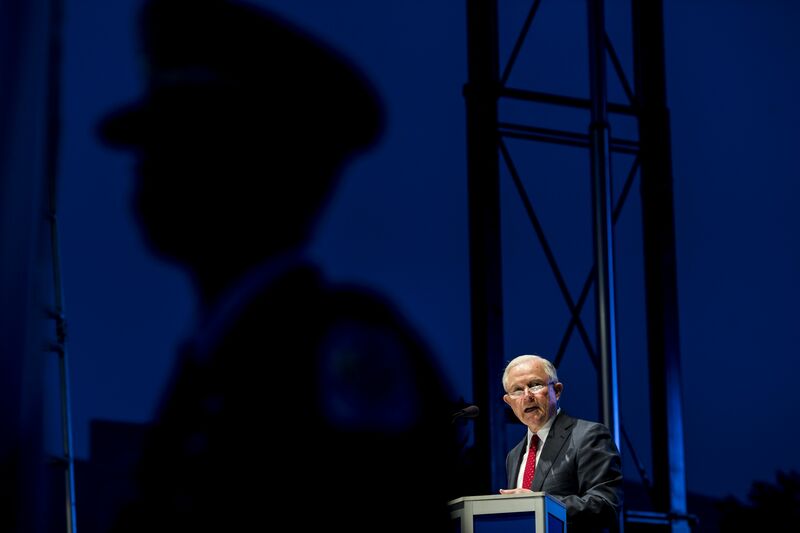 Attorney General Jeff Sessions speaks in Washington last night during a candlelight vigil marking National Police Week. 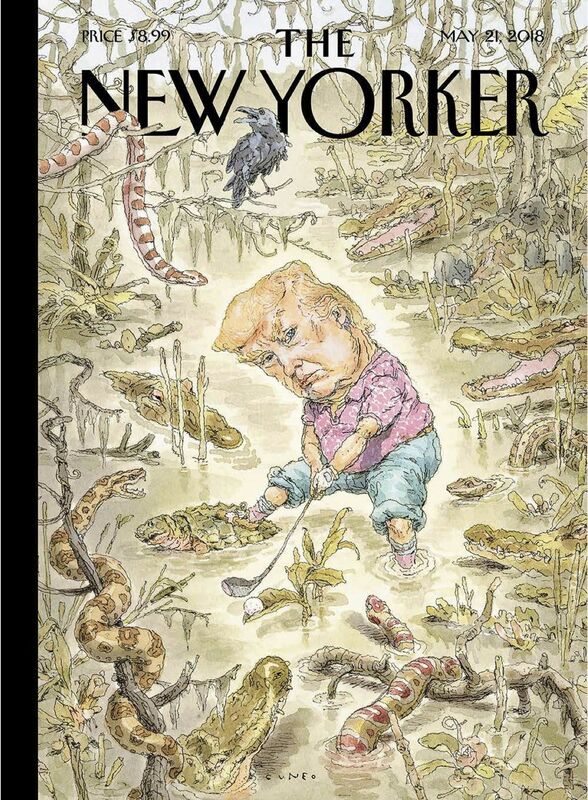 "The Swamp" by John Cuneo. Why it matters: "There’s been a lot of discussion the past year about where this broader moment fits in American history, which past era it might resemble. Are we living in 1968, on the precipice of more violence, assassinations, disruption, unrest? Is it more like the 1970s? Or a different period, something new altogether? What is certain is the disquieting way June 14 slipped beneath the news so quickly." Read the reporting, which includes on-record interviews with 20 people who were there. Trump’s deregulatory push has Washington lobbyists anxious and industries parting ways with usual Republican Party allies. Automakers are finding it tough to work with the Trump administration on what most of them say they want: a slower rate of still-increasing fuel efficiency standards. Electric utility companies want some kind of regulation cutting carbon emissions from their operations. The world’s biggest oil and gas companies, including ExxonMobil, Shell and BP, support the Paris climate deal. Financial engineering (the explosion in share buybacks). "[T]he rise of intangibles like intellectual property and brands (both of which the company has in spades) relative to tangible goods as a share of the global economy." Record levels of mergers and acquisitions. 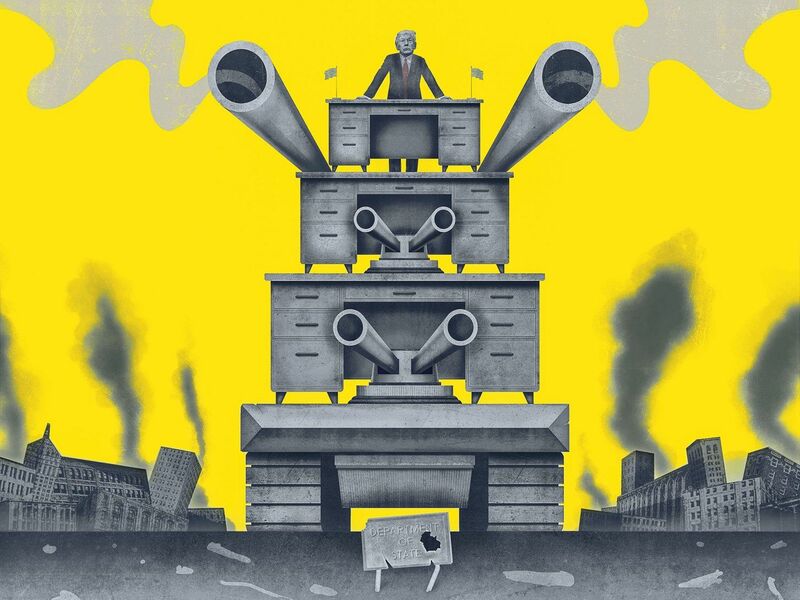 "[T]he next big crisis probably won’t emanate from banks, but from the corporate sector. Rapid growth in debt levels is historically the best predictor of a crisis. And this year the corporate bond market has been on a tear." "Tech-related deflation is a big part of what has kept interest rates so low for so long — it has not only constrained prices but wages too." Lessie Brown, a 113-year-old woman living in suburban Cleveland, is believed to be the oldest person in the U.S., after the death last week of a 114-year-old Pennsylvania woman, per AP. "Brown was born in 1904 in Atlanta and moved to Cleveland when she was 18. The Cleveland Heights resident had five children (three still living), and has 50+ grandchildren, great-grandchildren and great-great grandchildren. "Family members have attributed Brown’s long life to her eating a yam every day until she was 110." 9. 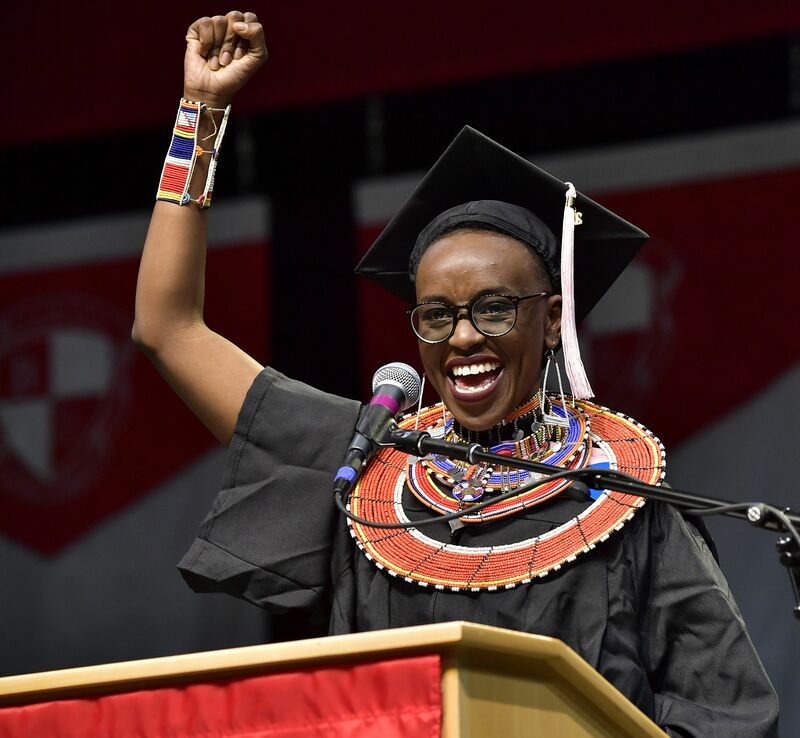 Commencement wisdom: "Click the link"
"Steve's vision was that great ideas come from a restless refusal to accept things as they are." "We reject the excuse that getting the most out of technology means trading away your right to privacy. So we choose a different path. Collecting as little of your data as possible, being thoughtful and respectful when it is in our care. Because we know it belongs to you. "The very notion of empirical fact is being attacked and corroded. ... People decide about an article's validity based only on its headline or the language in the tweet linking to it. They judge books by their covers ... I urge you to read the story. I urge you to think for yourself. I urge you to click the link." "Today ... many of those at the highest levels of power see the plain truth as a threat. They fear it, deny it, attack it — just as the communists once did." "[T]here is now more tolerance for dishonesty in politics than I have seen in my lifetime. And I've been alive for one-third of the time the United States has existed." "And as my generation can tell you: The only thing more dangerous than dishonest politicians with no respect for the law, is a chorus of enablers who defend their every lie." "Extreme partisanship is like an infectious disease. But instead of crippling the body, it cripples the mind." "Graduates: You're ready for this challenge. Because bringing the country back together starts with the first lesson you learned here: Honesty matters." "Artes de Cuba: From the Island to the World," which runs through May 20 [next Sunday], showcases the work of more than 400 Cuban and Cuban-American artists across more than 50 events. The program includes the salsa band Los Van Van and other musicians, visual artists, movies, theater companies and ballerina Alicia Alonso and the Ballet Nacional de Cuba." "It has come under fire from Cuban-American lawmakers, including GOP Reps. Carlos Curbelo, Mario Diaz-Balart and Ileana Ros-Lehtinen of Florida, as well as Rep. Albio Sires, D-N.J. They wrote to Secretary of State Mike Pompeo in April urging him to consider the advisability of allowing 'so many pro-Castro regime Cuban nationals' to enter the United States." 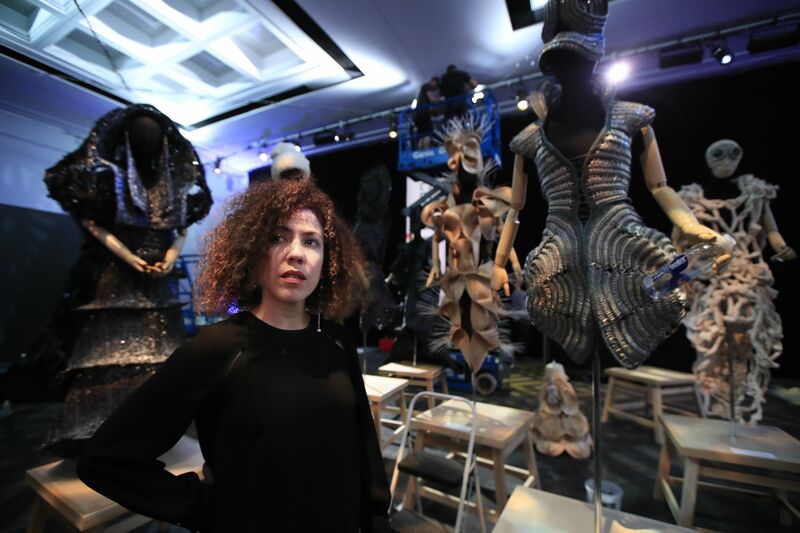 Curator Alicia Adams, vice president of International Programming and Dance at the Kennedy Center, said: "The Kennedy Center has a golden rule, and that is that we maintain the ultimate curatorial authority. Neither the Cuban government nor the American government dictated to us who the artists should be."